Arm Ergometer Workouts with Excy Make it Easy to Safely Cycling Your Upper Body Anywhere! 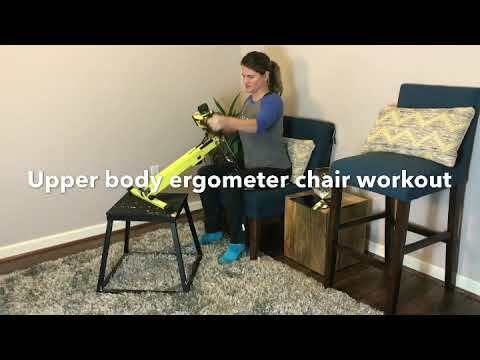 An arm ergometer workout with Excy can be as intense or light as you want them to be from the floor, the kitchen table, and even from the couch or a chair. In today’s live workout, we focused on a light 20-minute upper body hand cycle workout with the mobile coaching application set to 20 minutes. We then finished with a 3 minute higher intensity upper body spin. Improving upper extremity strength and endurance is important, whether training for sports or life. It can also be key to staying independent as we age, since we use our upper body for so many different things from reaching down to pickup the grandkids, to tying our shoes, to even picking up a laundry basket or reaching for items on a high shelf. Athletes, such as swimmers or triathletes, also use upper body arm ergometers to complement lower-body training and to build strength. There are so many compelling reasons to incorporate an Upper Body Ergometer (UBE) into your training schedule that range from endurance, intensity, agility, stability, flexibility and balance. A quick “arm ergometer” search on Amazon will serve up 45 results showcasing a variety of systems, including Excy. Items vary in pricing from as little at $17.99 for an exercise peddler to $4,495 for a First Degree Fitness Medical Fluid Upper Body Ergometer with Heart Rate Reception. Where Excy stands out is in its portability, quality, and total versatility for a full body anywhere workout. It also helps that we have 20X the resistance of any portable exercise bike with a range 2-70 pounds of resistance loved by athletes, sports trainers, physical therapists and health conscious individuals. Take a deep dive into all the features and benefits of arm ergometer workout devices and of course, we invite you to explore Excy if looking for a quality anywhere workout with unique benefits for cardio, strength training, and rehabilitation from seated, standing exercise, and rapid wheelchair access. For more examples, visit our Arm Cycling YouTube channel. Always talk to a doctor before starting a new exercise program.